October is PowerSmart Month and I have partnered with BC Hydro over the next few weeks to bring you contests, rebate offers from local retailers, energy-saving tips, and event info. This week’s theme is electronics. From October 8th until the 14th, save 15% off all ENERGY STAR major appliances from Bosch, LG, Samsung, and Whirlpool at Future Shop. Since 2007, the Government of BC has banned certain electronic equipment from being included in trash collection. Reuse and recycle old electronic equipment (computers, printers, fax machines, telephones etc.) at local Return-It centres or independent centres like Free Geek. Some manufacturers like Samsung also have their own programs for recycling their devices. When it comes to replacing old electronics, you can also be Power Smart. You may not always remember to turn off the light or unplug your charger but having electronics that are already certified as being energy-efficient is a bit of a no-brainer. This all starts with looking for the ENERGY STAR logo on things like refrigerators, radios, DVD/Blu-Ray players, and televisions. You can research the power usage of Plasma versus LCD versus LED technology or even look at the packaging that contains your product. You can view some really great tips for being power smart around your home submitted by readers in my Week 1 PowerSmart Month post. Team PowerSmart will be at Langara College’s 40th anniversary tomorrow and on the SFU and BCIT campuses on Thursday. The Coquitlam Express will host BCHL PowerSmart night at their game on Friday, October 15th. I have two $100 gift cards for Best Buy available. To enter to win, please leave a comment about your latest electronics purchase (or your next) and if you took things like ENERGY STAR (or similar ratings), consumer reviews about their energy-efficiency, or packaging into consideration when making your purchase. I will draw two winners, who will each get a $100 gift card for Best Buy, on Monday October 18th at 12:00pm. Follow @PowerSmartBC on Twitter for more tips and contests happening throughout the month. Update The gift card winners are Connie and Chris. Stay tuned for this week’s contest and PowerSmart Month information. My next purchase will be a new TV to go with my recently upgraded first adult-living-by-myself apartment! I will definitely look into energy-efficiency ratings when making this purchase, as it’s something I’m not terribly familiar with. Thanks for the tips! My next purchase will also be an energy efficient TV! Thanks so much for all the great information. Exactly as above – Glee would be far more gleeful with a Energy Star TV, non? I recently bough a new plasma tv after my 10 year old tube tv kicked the bucket. It was comforting to know I could bring my dinosaur to a Return It center, whereas 10 years ago I don’t even think that was an option. And major electronics just aren’t worth purchasing if they don’t have EnergyStar. The earth and your hydro bill will thank you. My next purchase will be an Apple laptop computer which should be much more energy efficient than an old tower with monitor. Although they do not advertise it heavily, Apple computers are Energy Star compliant. Everything I buy has a ENERGY STAR sticker. I wont purchase anything without it. I bought a tv and it is energy star. When doing the research, I considered how much energy it uses. 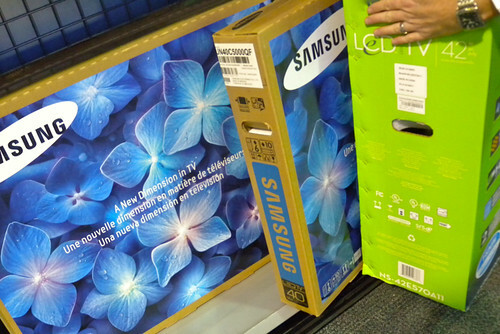 There was much less packaging compared to how tvs used to be packaged! I purchased an alarm clock! I did not notice any energy star sticker on it but it does have a dimming feature to conserve energy! My next electronics purchase will probably be a cell phone. I didn’t consider energy efficiency as one of the criteria before but I definitely will now. I want to buy a new TV soon. My old one consumes a lot of power, and energy savings will definitely be a factor for the new one. i recently purchased a fridge and was concerned about energy savings..
i’d also like to get a bluray player and hadn’t really thought about the energy factor on that..
my recent purchase was a washing machine. I was going to buy a new TV but had to change my plan…with no choice. I recently purchased a washer and dryer set. The main reason I chose the set I did was because of the energy star rating and low water usage. I recently got an iPhone. Now I can check my e-mail without having to start-up and run my computer to do it. My most recent purchase was a iPod Touch. There’s not much choice in terms of energy efficiency for mp3 players that I know of, but one of the first things I did was alter my settings so that I was using my battery power as wisely as possible. A new computer. As much as I’d like to deny it, the one I have now is on its last legs. Definitely looking for energy efficient laptops. My last electronic purchase was my iPhone which in a lot of ways has replaced my laptop, saving energy overall. Have been researching a new TV, but never had taken into account the savings (especially power saving) after the purchase. Now there’s even more options to consider between my LCD, LED and Plasma shopping!! Off the top of my head, I guess my latest electronics purchase isn’t technically electronics, but it’s close enough. I got a deal on Beatles Rock Band for the Xbox 360. I didn’t factor in the “green” factor, but I do use rechargeable batteries (NiMH) for all my video game controllers, so I guess that’s good. The bad news is that these “band” games are costly to ship (from an environmental standpoint, since the boxes are so big) and they come with way too much packaging (also not green). All companies should learn how to reduce their packaging and/or make them more easily reusable/recyclable. My next purchase will be a desktop computer and I definitely take energy-saving into consideration when I buy. As well as other green ideas. I just bought an HP laptop and it actually DOES have the Energy symbol on it so I’m ahead of the game! The packaging was also recyclablable and didn’t have anything that couldn’t be, so great for HP for being on the bandwagon!!! My next purchase will be a toaster oven so I don’t have to start up the big oven for a cooking a small dinner. I will definately make sure it is energy-saving. I will be buying a tv in the near future and yes, energy savings are a consideration, more so than packaging. my last electronic purchase was my iphone and I didn’t take energy into consideration at all. I honestly didn’t even think about it. My next electronic purchase in the next 2 months is going to be a new TV and now that I know there’s an energy star rating I will absolutely take it into consideration. My last purchase was my second tv for my basement and I definitely thought about energy usage when making it! It not only helps the environment but helps keep money in my pocket month after month. 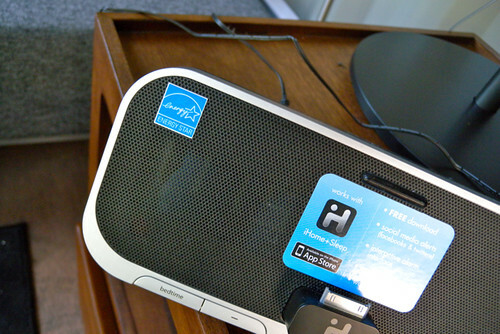 It sports a fancy energy saving sticker and despite the slightly higher cost it certainly is worth it in the long run! Our next purchase is a washer/dryer combo – the townhouse we bought is tricked out with Energy Star appliances EXCEPT in the laundry room. Even using cold settings only, these old monsters eat at the Hydro bill like… well, like two hungry behemoths eating an edible thing. We’ve been researching things for a while and talking to family members – they’re giving us anniversary and Xmas contributions so we can buy them in the New Year. We’re aiming for the best efficiency we can afford, because we’ve got a new baby coming and don’t want to be using those beasts with the wee one doubling the laundry load. My next purchase will hopefully be a Nikon D7000. I don’t think Energy Star ratings really apply. I just moved out so i bought a tv and washer/dryer combo. I made sure they all had Energy Star. I am hoping to purchase a new computer monitor in the near future. I will definitely be looking for the eco-friendly monitor and hope to save a lot more energy with my purchase.I will be recycling my old monitor as well as all the packaging from the new monitor. Just got a Sharp Aquos BD player, It has the EnergyStar logo right on the box and has “Smart Setting” that include Standby Mode (low power consumption mode) and Auto Power Off, which turns the machine off after 10mins if playback is stopped. Amazing,these machines are getting so smart! My most recent purchase was a cell phone, i charge it through a solar charger that sits on my window sill rather than through an a/c adapter. Next purchase will be a HDTV that my wife and I will buy each other for Christmas and birthday gifts. Energy savings is always a good thing. I’m always looking for energy star appliances but to be honest – I wish the standards were higher. I believe Europe has fridges, for example, are WAY more efficient than our energy star ones… but I can’t get any here. That’s a bummer. I also appreciate that stores like Best Buy allow you to drop off your old electronics to be recycled (responsibly, I hope) – since we can’t (and shouldn’t) pitch them in the dumpster. Bought an Ipad, but in this case of buying a brand name as well as a product, even if I wasn’t happy about the excessive packaging (which, I have to admit, wasn’t too bad, props to Apple), I would still buy the intended product. When it comes to making a purchase decision, I take these non-monetary things into consideration: consumer reports review, energy star rating, word of mouth information. Recently, I have also tried to make “green” purchases. ie A product that is more energy efficient than its competition or has recycled packaging. My latest ‘electronics’ purchase was a Sony Bravia LCD TV that has an LED backlit screen. I definitely look for the Energy Star logo when making big electronic purchases due to the fact that not only does it give me a peace of mind when my hydro bill comes but at the same time it conserves my energy usage at home as well. I don’t plan on any big electronics purchases currently however i would like to buy my kids an Ipad for Christmas!! The gc would def help me out! I recently bought a macbook, but it never occurred to me to think about its energy efficiency! I am going to be buying a new desktop soon and will definitely be looking at power smart options! my last big purchase was a new digital camera. Not much to do to be powersmart with it, besides making sure I unplug the battery charger as soon as the charge is finished! I bought some fluorescent energy star light bulbs. I definitely took into consideration how effective they were going to be, how much energy was used and how long they would last, I’m very satisfied with them. I rarely buy electronics, but my next purchase will be a laptop to replace my 5 year old desktop. I will definitely look into energy conserving laptops when the time comes as laptop models change too quickly to research too far in advance. I recently bought a laptop, and it does have the EnergyStar logo on it. But all laptops do, so I didn’t take that into consideration when I bought it. My last purchase was a laptop. I did not take into considerationENERGY STAR (or similar ratings), consumer reviews about their energy-efficiency, or packaging when making my purchase. I am still looking for an air-con even though winter is approaching, and been researching ones that doesn’t produce ozone and energy save. we actually just donated our old cell phones to Cell Phone for Soldiers. Found out about it when we did a online purchase. It’s not energy-efficient related..but at least it gets to be reused for a good cause. I recently purchased a 32GB iPhone 4, heavier in weight as with a bit more memory storage. Might be planning to buy a new TV soon. Will definitely be Energy Star! I buy a lot of screens for work. They may as well be as energy efficient as they are beautiful! My latest purchase was ipod shuffle. The packaging was minimal which was great. Usually I do take the energy efficiency into account when purchasing electronics. Any appliance I buy definitely is Energy Star certified. For smaller electronics, I’m looking to buy a new camera soon, and efficient battery life/charging is something I’m looking at – don’t want to be charging it every day when I’m on a trip! I recently bought a laptop and I dont really see if its energy efficient or not as I assumed it automatically should be. I heavily relied on reviews for my purchase though! new plasma energy star tv !! My next purchase will be a new flat-screen television for my parents. The amount of energy it uses will be a major consideration for me considering they spend so much time in front of it. I try to minimize my electronics’ turnover rate (try to maximize their lifetime by taking good care of them and don’t buy any replacement until necessary). The most recent purchase is probably my laptop since I have used my old laptop for ~5 years and it broke down. energy efficient is def important when i select electronics! Will be looking to get a blackberry so I can access my mail without having to turn on the computer. my last electronic purchase was an small samsung lcd tv. it did have an energy star on it. Im more swayed to buy things that have an energy star on them so i can save on energy. I’m looking to purchace a new phone in the near future and like many have previously said – phones aren’t typically powersmart. However, you can make them “powersmart” by simply unplugging the charger when it is not being used. Leaving a cell phone, laptop, or any other electronic device charger plugged in a socket still wastes power! We’d most likely get a microwave. And it’s great to know there are places like Return It that take your old ones. We do try to take good care of the gadgets we buy – get more life -use less. Our last purchase was a tv as well, and we definately took the fact that it had “energy star” into consideration when purchasing it. We also use the proper settings on the tv in order to save as much power as possible, except when the hockey game is on, then we switch the the picture for the game. Next purchase is to be a new dryer, can’t hang my clothes outside in the winter all I would like to. My last electronic purchase was a mini laptop. I definitely look for low energy electronics to Keep my hydro bills low. The mini laptop uses hardly any power, and one charge of the battery and it lasts forever. I recently purchased a washer and dryer that have the energy star rating. My husband really wants a new TV. Last summer we put in a new hot water tank that only makes hot water when you need it. We also put in a heat exchanger.Now we need a new t.v. to replace our 12 year old energy sucker. I’ll be buying an Energy Smart flat screen tv next. I want to do my part in conserving energy. I am planning to buy an Energy Smart TV soon that is energy efficient and excellent in quality. I would LOVE this Best Buy gift certificate to help me with my purchase! My next purchase will be a fridge and it will be an energy star fridge. My next electronics purchase will probably be an iPhone 4. When buying bigger devices like TVs and appliances it’s definitely a good idea to look for the Energy Smart label to save power and money! I think my last purchase was a Macbook…love it to pieces! My latest purchase was a powerbar to turn off when I leave my apartment. My latest purchase will be a multimedia dock for my TV so that I don’t have to leave my computer on to watch my home videos! Moved from an older PC to a new iMac (LED backlit) and have it sleep after 5 minutes of inactivity. All the lights are now CFL’s and will go to LEDs when the price comes down somewhat. hoping to purchase a new computer monitor in the near future. I will definitely be looking a engery star monitor and hope to save more money and energy! We will most likely be purchasing a dvd player so we can stop using our laptop to watch movies. I didn’t know that tvs and dvd players are energy star rated. I will definitly be looking for the logos! I got the previous version of the ipod shuffle. I didn’t really think about energy or packaging efficiency. I will pay closer attention to that from now on! I am gradually changing out my appliances for better Engergy Star ones. My most recent purchase was a front loading HE washer….it has really cut my consumption, especially as I do mostly cold water washes. my last purchase was a ipod shuffle but it never occurred to me to think about its energy efficiency! my next purchase will be a dslr camera ! Bought an 11.6 inch Acer “Olympic edition” laptop. Does eveything a larger laptop does but with longer battery life because of smaller screen. So yes, energy consumption was a factor. Our most recent electronics purchase was a Panasonic Plasma, and it is energy star rated. That was one of the reasons we picked this TV. “Need” to buy a TV. Energy-efficiency is always a consideration. my next purchase would be an ENERGY STAR approved lap top! My last purchase was a Macbook…. I have no idea what its energy rating is but I’m curious now to find out! My Mom just bought a dishwasher and I helped with the research. From reading consumer reviews we took in mind energy ratings for sure. I recently purchased a new Macbook because Apple is a socially responsible company and the Macbook is energy efficient and easy to manage power setting on, and I have gone paperless billing on all accounts I am able to with and then just use the Macbook to log on and make payments! My next electronic purchase will be a DSLR camera. My next electronic purchase will hopefully be with the $100 gift certificate that I’ve won! And, I will buy something with EnergyStar on it! I’m looking to buy an energy star fridge. My isn’t sealing properly, which is an energy waster! My next purchase is going to be a new Nano. I love how its smaller then before, therefore using less plastic. BUT the packaging is sill pretty bulky. All in all, a energy star rating on big appliances is a must. An iPod touch…from Best Buy! Very energy efficient! I will be purchasing a new tv soon and will definitely make sure that it is EnergyStar rated. For right now, I put all my electronics on powerbars for easy turn off – so I am not getting the dreaded vampire energy sucking. I use energy star light blubs throghout my house as well as my tv, refrige, dishwasher and dryer. I live in a GREEN condo by Adera – the fridge, oven, dishwasher and washing machine are all ENERGY STAR and they are fantastic. I am looking to buy an iPod touch from Best Buy! haven’t bought anything recently and not planning to. what is bette than saving energy?… not buying something that uses it. My next buy will definitely be an energy star TV. Couldn’t believe tvs use that much energy consumption when they are turned off! Great info! My latest purchase was a new tv for the kitchen. I confess I didn’t check for ENERGY STAR (or similar ratings), assuming most good products these days have it. My next purchase is a set of rechargable batteries for my remotes and controllers. One of the problems with older gen NiMH batteries before is that they tend to drain by themselves. Now the pre-charged ones can actually be recharged hundreds of times and retain most of their capacities. Most recent purchases were a new touchscreen computer and blackberry. I bought an Energy Star laptop during Boxing Day last year and I am now using it instead of my desktop, which uses a lot more energy than a laptop. When just bought a cordless phone set and definetly took the Energy Star rating on the box into consideration when purchasing. We soon plan on purchasing a TV & the energy star rating will be important. Our last purchase was new appliances and this helped us decided on which model to choose. I recently got a smartphone – I can check my e-mail and surf the web without having to turn on my computer, so I’m definitely saving energy! I just purchased a new phone as a gift to my teacher. She is very environmentally friendly so I definitely took into consideration when buying the phone to see that it had an Energy star sticker! When we moved, we made sure all our major household appliances had the energy star – washing machine, dryer, dishwasher, fridge, oven and microwave. We hang most of our clothes and linens to dry, the drier rarely gets used. We wash in cold water & make sure the dishwasher is full before we run it. My next electronics purchase will either be a new desktop, phone or vaccum cleaner, whichever dies first – not very exciting. Although I try to actively monitor that my electronics purchases are powersmart, I don’t actively monitor their actual consumption levels. I really should do that more often. I always consider Energy Star, and customer reviews are essential. I recently purchesed a dishwasher and it has energy star. I didn’t know that DVD players and TVs had engery star too but it makes sense. I am planning to buy a bluray player so I will have to look for an energy star one. I bought a DVD with minimal and biodegradeable packaging from Best Buy. My last purchase was a bamboo tablet for my graphic design course in school. My next purchase will most likely be a all-in-one printer. I am hoping for a energy star product with a large capacity ink cartridge so I won’t have to replace it as often. Recently bought a Samsung LED TV to replace the old power hungry (and huge) one. Plus I got it from London Drugs, they have a great recycling program for all the packaging from anything you buy from them. My last purchase was a energy star rated microwave. because or last one was a power hog. next purchase will be one of those flat phone chargers that you can place your phone on. i wouldn’t have thought to check for an energy star on it but now i will. We replaced an older TV with an energy efficient Samsung one. I’d like to buy more energy efficient light bulbs but the CF bulbs don’t seem to last very long for the price of the bulb and the LED ones are just way to expensive. I always look for Energy Star and ratings when buying new electronics. My boyfriend is very conscious of his energy consumption. He unplugs all small appliances after using them, and even shuts off all unneeded breakers in the house if he is going to be away for an extended period of time. The thing that gets me is the fact that he still has his 13 year old tube TV. I hate watching TV on that thing, the colours are so dull, and when something is being aired in widescreen format, the image is so small on the screen. I’ve been trying to get him to upgrade the TV for a while and I recently got through to him using information from a published report about the fact that new, LCD, HDTVs are more power smart then his current TV. Now my only challenge is getting him to part with the money it will cost to buy the new TV. I am sure a $100 Best Buy gift car would help convince him! My next purchase will be a Sony LED TV to replace our present TV which is still an old style “tube” TV. So we can all just imagine how much energy this old TV is using. I am excited to see the difference in the energy savings!!! We just bought a new, energy efficient fridge. Next, a new deep freeze! (I know, not very exciting). Plus, looking forward to participating in the Candle light dinner event Oct 21. I am hoping to buy a new laptop soon and have not yet checked the energy efficiency, but make a point of turning off my current desktop computer whenever I leave my apartment. Just bought energy star washer dryer combo! During the summr, I dry line my clothes…let’s save energy! I just bought a Canon all-in-one printer and it does have the energy star logo. I’m going to get a new phone and I’ll keep it energy efficient by not leaving the charger in when I’m not using it. My next purchase will be a washer and dryer. Energy star rating is my top priority for making my decision. Cost and energy saving would be very important to me. I will also read consumer review to look for specifically about the machine quietness level as well. Hello, we bought a new dishwasher that had an energy star rating. It’s also very quiet, nice! A new thermostat is on the list of next purchases… obviously saving energy (and money) will be high on the list. My next purchase will be a television. I will take energy consumption into consideration. That and performance are the most important to me. Most new TV’s are energy efficient nowadays. My next purchase of a Stove that i need urgently will have Energy Star! My most recent purchase is a Sony E-Book…..much more power efficient than using a laptop or Ipad for reading books! One of the reasons I spent a little extra $ in purchasing a Macbook laptop was its commitment to the environment. I saw it had an energy star rating and I know lower power consumption lessens the environmental impact of greenhouse gas emissions from power plants. Next purchase: Iphone speaker dock. Energy rating always a consideration. Will avoid any model that solely uses batteries. Hoping to buy a new netbook. Hoping that it has Energy ratings and able for me to save on electricity so I can reduce consumption and also reduce my electric bill! Energy Star has been the greatest influence for me when buying electronics. Its a no-brainer if you can get the same quality with less energy expenditure! I only buy electronics at Best Buy because they usually have what I want, the price is low and I get POINTS! Next purchase will be a DSLR camera – hopefully soon, but probably sometime next year. I think of Energy Star ratings as a nice bonus and consider packaging much more. I get pretty angry when I see a product is needlessly smothered in wasteful plastic. My last electronics purchase was my laptop, and I’m proud to see the little Energy Star sticker shining up at me next to the mousepad. I’m also loving all the different power options that I can choose from on the battery console. And that’s exactly what I plan on buying. Lego Batman for Wii for my kids!! My last electronics purchase was from Best buy and it was a 47″ LG LCD. I went there because I’m always guaranteed to find the cheapest prices! I purchased an energy efficient LG tv from best buy. Great picture and super low power usage.. A great deal on sale..42 ” for $650! Had to spend 20 mins turning down the ‘extras’ that would’ve brought the cost up another 100..worth it! Our next purchase at home will be new washer and dryer and energy efficiency will play a big role in our purchase decision. Our appliances are quite old so when they were bought, energy efficiency wasn’t as big of an emphasis. Now being a smart consumer, we’ll look for the Energy Star label and pick out one that doesn’t use a lot of energy. My next electronics purchase will be a new computer. I’m not familiar with power ratings for computers, but I do turn off my computer every night to save! I recently purchased a new sony vaio laptop from bestbuy. I picked this one out of all the other differnt laptops because it was the only one with the energy-efficient performance of an Intel Core 2 Duo processor with CULV technology (Consumer Ultra-Low Voltag) which gives it up to 8 hrs of battery life on a single charge. Hey I loooove best buy!!! My macbook is being powersmart… the hard drive died and now it won’t turn on. My next purchase will be a laser printer all-in-one. I wouldn’t have thought to look for an energy star sticker but now I will! My next purchase will be a new canon elph. Future shop currently has a great incentive for people that are looking into buying a canon camera/camcorder. Bring in your old/broken camera/camcorder and future shop will give you a discount on camera/camcorder over $200. I’ve got an old camera that I rarely use and I think it’s a good time to buy a new camera. I need to be ready when Mark Walberg comes to Vancouver (whenever that will be)! Bought an energy efficient fridge recently! And my husband just bought a Kobo eReader! dry line during the summer! energy star washer dryer for the winter! Recently bought a tv with Energy start rating!